In company after company that Sanjay Khosla and Mohanbir Sawhney worked for or researched, they saw businesses taking on more products, more markets, more people, more acquisitions—adding more of everything except what really mattered: sustainable and profitable growth. And in many of these companies — large or small, from America to Europe to Asia — every quarter became a mad dash to find yet another short-term revenue boost. There had to be a better way — an alternative to the scramble for mindless expansion. The answer lies in Fewer, Bigger, Bolder, a market-proven, step-by-step program to achieve sustained growth with rising profits and lower costs. The authors prove that given the right incentives, managers using this program can produce astonishing results in amazingly short time frames. That’s exactly what Khosla accomplished as President of Kraft’s developing markets, which enjoyed eye-popping revenue growth from $5 billion to $16 billion in just six years, while profitability increased 50%. 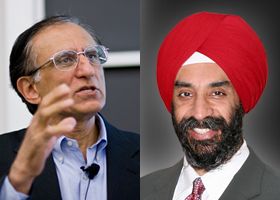 Sawhney, a professor at Northwestern’s Kellogg School of Management, discovered a similar formula for stellar results when advising a portfolio of businesses, from Fortune 500 giants to technology start-ups. No matter how big the company or how difficult the economic environment, managers who use this seven-step program (“Focus7”) will learn how to make fewer but bigger bets and to create a virtuous cycle of growth. 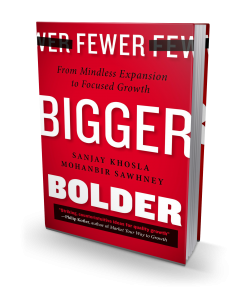 Fewer, Bigger, Bolder crosses the usual boundaries of strategy, execution, people and organization. Its framework shows how you can drive growth by targeting resources against priorities, simplifying your operations, and unleashing the potential of your people. By challenging the conventional wisdom about growth, Fewer, Bigger, Bolder is likely to ignite a vigorous debate throughout the business community. It’s a game-changing book that couldn’t be more timely. Or more needed. As President of Kraft Foods, Developing Markets, Sanjay Khosla oversaw revenue growth from $5 Billion to $16 Billion in 6 years across over 60 countries. Since 2013, he has been serving as a management consultant, a Senior Fellow at Northwestern University’s Kellogg School of Management and a Senior Adviser at BCG. Professor Mohanbir Sawhney is a globally recognized scholar, teacher, speaker and consultant in business innovation, technology marketing and digital marketing. He directs the Center for Research in Technology & Innovation at the Kellogg School of Management.